The river's running pretty high right now. Parts of Yeatman's Cove are underwater. What now looks like a real cove, normally is a large concrete platform. I went on a stroll early this morning and took a few pictures. The weekend mornings downtown and especially along the river are so beautiful on days like today. There are a few metal benches that line the upper plaza along Yeatman's Cove and I sat there for a while this morning with my IPod and coffee and was amazed by both the calmness and fury of the river. 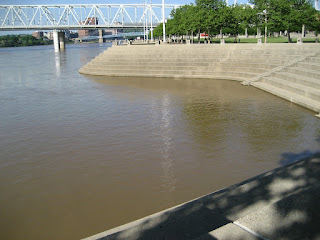 It would have been a sight to see this area when the river was the driver of Cincinnati economy. I only saw parked boats this morning. I didn't wouldn't have expected to see many out at 8:30 on a Sunday morning. I think the high waters makes it more of a concern for boaters, so it doesn't surprise me the waters were sans vessels. I really enjoy walking on weekend mornings and going down to the Cove will likely be a regular destination for me this spring and summer. Greenspace and a waterway make a great front lawn for the city.